The piezoresistive pressure transducers Series M5 from Keller are ideal, thanks to the M5 fine thread, for taking measurements at close proximity in places where access is a problem and in very thin pipes – exactly the kinds of conditions associated with engine test benches. The front-flush design prevents gas bubbles interfering with fluid measurements and supports measurements up to 200 °C without a cooling adapter. The extreme dynamic range of 0…50 kHz makes it possible to record very fast pulsations just as reliably as those associated with static pressure values. A vibration-resistant Teflon FEP cable (IP67) ensures the 80 mV output signal is routed securely out of the hot environment and then onwards for processing. and effective isolation of mounting forces, and a very low dead volume. 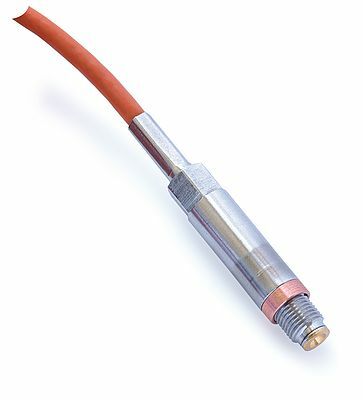 Thanks to the materials used in the pressure connection (silicon oxide, stainless steel, and gold), the pressure transducers in the M5 series offer excellent media compatibility. They are designed for operating temperatures between -50 °C and +180 °C and come with a typical output signal range of 80 mV (based on a 1 mA supply) and an individual calibration certificate. The unit which incorporates a remote measurement amplifier is known as the Series M5 HB (see the data sheet) and can achieve a total error band of ± 1 %FS for the operating temperature range.